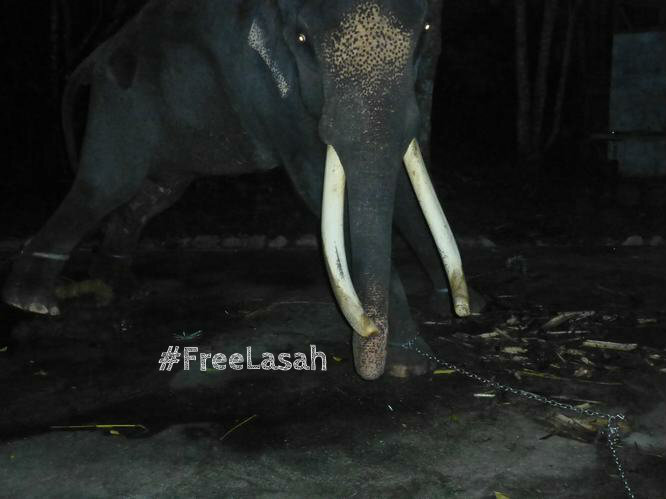 Three days ago the Malaysian environment ministry declared that Lasah will remain at the Langkawi Elephant Adventures [LEA] after an evaluation. In a publication by a government owned news agency [re-published by The Sun Malaysia] the ministry stated that Lasah is in a "healthy condition" based on checks by the Wildlife and National Parks Department (Perhilitan) and the Malaysian Association of Zoological Parks and Aquaria (Mazpa). Mazpa has previously said that elephant rides provides Lasah with exercise, an excuse while ignoring the fact that elephants used in rides are abused. - Our concerns regarding Lasah's health, use and abuse has never been addressed to us, including in the article above. - In March, eight months after the campaign for Lasah started, the environment ministry finally said that "only two of Lasah's legs are tied" [when not exploited for tourist money] and called it normal practice. - The ministry and LEA claim the latter abides by the law. However our emails to the former regarding Lasah's [daily] chaining relating to Malaysian wildife laws were never responded. We will not give up on Lasah and will continue campaigning. More updates soon. Thank you for all you have done so far. Please email the Environment Minister of Malaysia (NRE) to ask for Lasah's transfer to the Kuala Gandah elephant sanctuary. The Wildlife Department, the prime minister's office, Lasah's owners and others will be copied in the CC list.